To order: Please visit our Poly/Dyne Treat Check Pen order page. The Poly/Dyne Treat Check Pen is a 38 to 40 Dyne Range Pen. Intended as a quick reference for line operators, the Poly/Dyne Treat Check Pes are an easy way to check for treatment on plastic substrates. 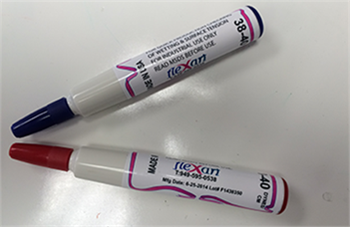 This unique pen, when applied to a substrate, produces a solid, easy to see, blue or red (depending on ink color) stripe. If the substrate is at a level equal to or higher than the 38 to 40 Dynes, the solid stripe will hold. If the treat treatment is less than 38 to 40, the stripe will fade away, within five seconds after applying. The Poly/Dyne Treat Check Pen contains an alcohol based liquid that produces quick results, making it perfect as a quick reference for line operators to check for treatment. The Poly/Dyne Treat Check Pen is commonly used by film extruders, who are looking to assure a minimum treatment of 38 Dynes. It is also commonly used by printers and laminators, who are trying to determine the treated side of the substrate, during set up and if any back treat occurs will printing. Overall, Poly/Dyne Treat Check Pen is the simplest, most user friendly, easiest to read dyne test pen on the market. The Poly/Dyne Treat Check Pen is available individually or in boxes containing 12 pens per box @ $5.00 ea. The expected shelf life of our Poly/Dyne Treat Check Pen is one year but can last longer but may vary based on use, exposure to the atmosphere and storage conditions. Always store in a cool location.